"An experiment on an animal gives no certain indication of the result of the same experiment on a human being. "- Robert Koch, microbiologist and Nobel Prize winner (Medicine)We can't stop experimenting on animals. If we did, what would we experiment on? Where would we get new medicines from? Surely we must continue our experimentation on animals. This is a common argument. One I've used myself to rationalize animal experimentation. Here's what they say in school; animal experimentation is necessary, modern medicine is based on it, it saves human lives. We're taught this is the holy grail of medicine. That those who oppose this procedure are doing so out of sensitivity, and they argue with their emotions, not facts. In simple terms, animal experimentation is not up for debate.Most individuals in Western societies have used antibiotics at least once (often many more) as they reach early adulthood. It might've been for a cold or during a surgery. Antibiotics revolutionized medicine once it was discovered by Ian Fleming in the 1940s. It was sent directly to the battlefields to save soldiers' lives, and it has saved many more since then. It's a miracle medicine, almost.Fleming might have thrown his penicillin away entirely if he had tried it first on guinea pigs or Syrian hamsters instead of rabbits. It kills them. In addition, penicillin is teratogenic in rats, causing limb malformations in offspring. Fleming stated, "How fortunate we didn't have these animal tests in the 1940s, for penicillin would probably never been granted license, and possibly the whole field of antibiotics might never have been realized. "SACRED COWS AND GOLDEN GEESE examines the industry of experimenting on animals, and argues that no, animal experimentation is not a holy grail, it's uncertain business with unpredictable outcomes. The authors arguments are based on statistics and facts, not emotional reasons. There are no harrowing pictures of animals, but a long list of the failures and uncertainties of animal experimentation. We learn about the history of vivisection, how the Church for a long time denied any experimentation on humans or corpses. Instead, all medical research was carried out on animals, and it lead to misconceptions that would linger in the medial world for a long time. And for a while, when the ban was lifted and scientists could examine humans and their corpses, the knowlegde of human biology and medicine entered a golden era. For a while, scientists based their research on humans, not animals. But after lobbying, animal extermination was brought back in full force; even when it produced incorrect or uncertain data. Despite this, pro-vivisection lobbyists today claim that animal experimentation is what bought modern medicine to the level it is today. The authors show that these claims are incorrect; that while some animal experimentation produced results that corresponded to the same in humans, the knowledge could - and in some cases had - been discovered by other means (clinical research, for example). It's a big business, vivisection. It includes politicians, pharmaceutical companies, companies producing the tools for vivisection, universities that relies on grants and funds, and lobbyists. The authors show how they all go together, and how it all comes down to money; vivisection is performed because that's where the money is; politicians suggesting to remove or reduce research on animals might loose their voters, voters who rely on medicine and have been told that only animal experimentation will bring out the medicine they need; pharmaceutical companies that need to have their products tested on animals simply to be approved by the FDA; universities need it because that's where they get the grants from, and that's where awards might come from; and the lobbyists, whose paycheck depends on it.We see that the chances of vivisection producing reliable results in humans are bad. Far from a holy grail, actually. The authors have done their research; their arguments are based on sound science, reliable data, and solid logic. One of the facts that they derive their arguments from is that animals are no 'prototype of small humans'; while we share DNA to a great extent, we are different where it counts, and that is in our microbiology. Our cells are different, and it's on this level most diseases work on. Because of this, bacteria and viruses cause different diseases depending on what specie it inhabitants. Even the same type of disease can lead to different outcomes.Rat colon tumors kill by obstructing the colon. Human colon cancer kills by metastasizing to other places in the body. The tumors of the rat bowel do not usually spread. In rats, it is most often the small bowel that is affected; in humans it is the large bowel or colon.The authors goes on to show how damaging it can be to rely on vivisection. As seen above, penicillin might've never been used had we require it to be tested on animals. What other medicines might we have missed as they causes havoc in rabbits, rats, mice, and other animals? But it's not just missing medicines that are damaging; it's what vivisection can lead to.No matter how exhaustive the animal testing, problems can still develop. Fanclozic acid, a potential new anti-inflammatory drug, showed no side effect in mice, rats, dog, rhesus monkeys, patas monkeys, rabbits, guinea pigs, ferrets, cats, pigs, cows, or horses. But the drug caused acute cholestatic jaundice, a type of liver failure, in humans.SACRED COWS AND GOLDEN GEESE is an throughout investigation on how animal testing is damaging to our health and the progress of sound medicine. The arguments are complex, far too complex to be summed up in a review. And so, I have to agree with the foreword (by Jane Goodall) that everyone should read this, especially those going into the study of medicine. While Sacred Cows and Golden Geese is shelved with the books on animal rights philosophy, it in actuality is not an animal rights book at all—but rather an exhaustive study of how animal research bogs down and misleads science, and too often does not end up helping human beings at all. While the animal research lobby ascribes every medical discovery, both ancient and modern, to vivisection, the Greeks delve into the original research accounts and find that in many cases, conflicting results with animals delayed knowledge about the human condition. 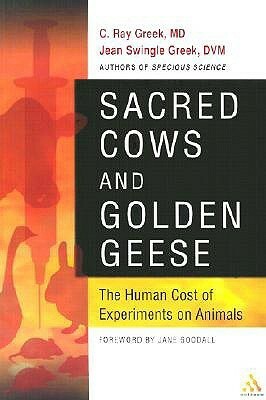 Sacred Cows and Golden Geese reminds us that, just like everything else, animal research is a business. From companies who breed animals for laboratories to those that manufacture cages and other supplies to researchers and universities that have come to depend upon grant monies, there are quite a few key players in the debate who do not wish to see their income lessened. The authors take note of both the PR campaigns and powerful lobbying efforts this industry funds. And let’s face it, the argument in favor of vivisection can immediately be spun in a blunt and emotional way –the life of lil’ Suzy or an ugly white rat?The pro-vivisection argument depends upon knee-jerk responses from a public that doesn’t ask many questions. The anti-vivisection argument is more nuanced and not as easy to squeeze into a billboard slogan or cable sound bite. Unfortunately, some of the people who should read this book most will not have the patience for its rather dry and dense text. Many corporations conduct animal research because the data is easier to manipulate to fit the corporate agenda. No where is this more infamous than in tobacco research. Big tobacco used animal studies to argue that smoking did not cause many of the health problems it was accused of, despite mounting evidence to the contrary. Sometimes these tests veered into the bizarre and darkly humorous:An example is the exhaustive Philip Morris campaign to persuade the public that smoking decreased the aggressive tendencies of humans. Here is a memo from Philip Morris in 1975: “We have had a guiding hand in designing studies of the influence of injected nicotine upon the predatory attack of cats upon mice.” See there, Jerry could have put away the frying pan in all of those old cartoons and just offered Tom a cigarette instead! And now, from cats to dogs: The American Cancer Society (ACS), another big bankroller of animal-model research, has the temerity to sponsor a fundraiser called “Dogs Walk against Cancer” wherein fortunate pooches, which have not been subjected to carcinogenicity testing, parade about with their owners. The ACS then takes this money and uses it to fund irradiation and experimental surgery upon less lucky dogs and other animals. I think this book is important in that it shows how animal experiments do not benefit human beings, except for a few, financially. The authors provide a brief history of how vivisection came to be the norm in testing medication, and then follow up with why it's wrong, from "white coat welfare" to chapters on cancer and AIDS and the inefficacy of animal testing to find cures for these (and other) diseases.So this book is needed. From an interest standpoint, I find it uneven. I mean, I was obscenely interested in the birth defects and other problems that come from drugs, particularly in the 1960s and 1970s, that were found safe on animals and that caused tremendous harm to human animals. But parts of it made my eyes cross, particularly where the authors talk about how specific genes work and how medicines work on those genes.Again, good for those who like and understand science and medicine, and probably well worth the read for anyone interested in understanding the persuasive counterarguments to vivisection. But not the most fascinating thing I've ever read. It's great to hear the educated truth from two experienced people in the field, one a DVM and the other an MD. The Greeks report one of the biggest conspiracies out there: the failure of animal testing. It's not an enjoyable book by any means, but it's got logic, facts, and a solid argument why the U.S. needs to follow other nations that have banned the horrible use of animals in the lab. Going into this book I already knew that testing wasn't necessary because of the technology we have today and some of the many failed drug experiments on animals that led to human deaths, but I didn't know the corrupt history of how we got to where we are today. Our greatest medical discoveries have either not used animals or did not need to use them due to previous human data. Clinical observation and autopsy have always been the most valid confirmation of any experiment, and today we have computers, mathematical modeling, and in vitro research with human tissue. The Greeks do a great job in laying out the argument that animal testing is not science based, but is actually belief based. This is a very biased book, and I want to believe it, so I'm dubious. But, given that I can't find any well researched argument supporting the idea that animals are adequate models for human disease, I am inclined to agree with it for now.The chapter on organ donation (can an animal "donate" an organ?) seemed like a bunch of alarmist speculation, but that may just be my unhealthy lack of concern for viruses. And the focus on education, prevention and policy change mostly made up for it anyway.This book also changed my mind about carcinogenics in food and personal care products. This was written by a husband and wife team. One is a doctor and another is a vet. It is about animal research and how it is not really helping the humans. For example, Cancer was cured in mice but it hasn't happened in humans.I knew that what works for one species will not work for another. I knew that freshly opened soda will kill mice as they can't burp but the same stuff will not kill us. I often wonder if the scientists missed some cures for us when they experiment with animals. A must read. I find it compelling that the authors used to believe that animal experimentation was valuable but have since done the research and changed their minds. The arguements are based on published facts and statistics rather than relying on emoions which do not stand up well in a intellectual debate. So far, pretty well documented book about the history of animal research - vivisection. Though disappointed they mentioned prions in passing and didn't throughly explain the DNA evidence to support their arguments. Note that prions is the one example that animal research is very worthwhile.Otherwise, seems their arguments against animal-medical research are quite solid. A lot of well-research information.